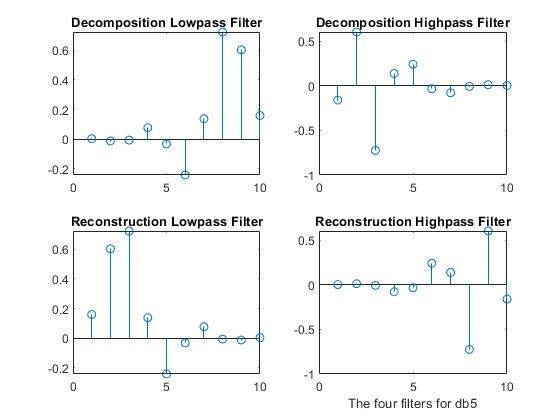 [LoD,HiD,LoR,HiR] = wfilters(wname) returns the four lowpass and highpass, decomposition and reconstruction filters associated with the orthogonal or biorthogonal wavelet wname. [F1,F2] = wfilters(wname,type) returns the pair of type filters associated with the orthogonal or biorthogonal wavelet wname. For example, wfilters('db6','h') returns the pair of highpass filters HiD and HiR associated with the db6 wavelet. Compute the four filters associated with wavelet name specified by wname and plot the results. Name of orthogonal or biorthogonal wavelet, specified as one of the values listed here. Type of filter pair to return, specified as one of the values listed here. Decomposition lowpass filter, returned as a real-valued vector, associated with the wavelet wname. Decomposition highpass filter, returned as a real-valued vector, associated with the wavelet wname. Reconstruction lowpass filter, returned as a real-valued vector, associated with the wavelet wname. Reconstruction highpass filter, returned as a real-valued vector, associated with the wavelet wname. Filter pair of requested type, returned, specified as one of the pairs of filters listed here. Daubechies, I. Ten Lectures on Wavelets. CBMS-NSF Regional Conference Series in Applied Mathematics. Philadelphia, PA: Society for Industrial and Applied Mathematics, 1992. Mallat, S. G. “A Theory for Multiresolution Signal Decomposition: The Wavelet Representation.” IEEE Transactions on Pattern Analysis and Machine Intelligence. Vol. 11, Issue 7, July 1989, pp. 674–693.